A few weeks ago, we took a look at the best badge hacks at the Hackaday Supercon. These were the best badge hacks anyone has ever seen – including what comes out of DEF CON and the SDR badge from the latest CCC. I’m ascribing this entirely to the free-form nature of the badge; give people a blank canvas and you’re sure to get a diverse field of builds. Now it’s time to take a look at the cream of the crop, hear what the jolly wrencher sounds like, and how to put 1000 Volts in a badge. There were three categories for the badge hacking competition at the SuperCon – best deadbug, best blinky, and most over the top. A surprising number of people managed to solder, glue, and tape some components to a the piece of FR4 we used as a conference badge, but in the end, only three would win. The winner of the most over the top badge at the Supercon comes directly from one of the workshops at the SuperCon. [Paul Stoffregen]’s Microcontroller Audio Workshop introduced a few dozen people to the audio processing power of a Teensy 3.2. 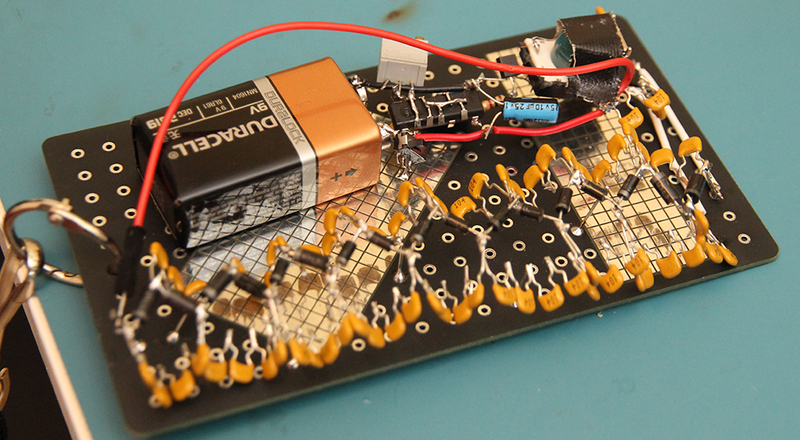 This workshop used a Teensy, audio adapter board, microphone, buttons, and pots to turn a tiny microcontroller into a relatively powerful audio processing board. [Nate Quillin] attended this workshop and the badge hack he came up with was an audio and visual treat. 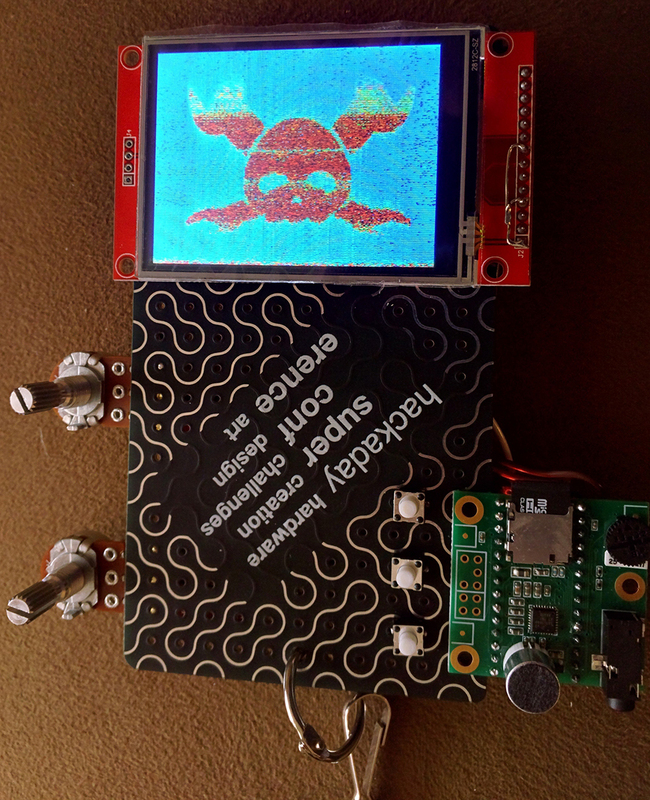 [Nate] was kind enough to put his badge hack up on hackaday.io, and this project shows off everything his confabulation of pots, teensies, and displays can do. The Teensy controls a TFT that displays jolly wrenchers, space wrenchers, and a spectrograph of everything the microphone is listening to. In an ingenious twist, [Nate] took a page from Aphex Twin and turned the Hackaday logo into sound. You can check out all the display modes in the conference video. [Sprite_TM]’s spark gap badge. A Spark Gap is necessary for a Tesla Coil. 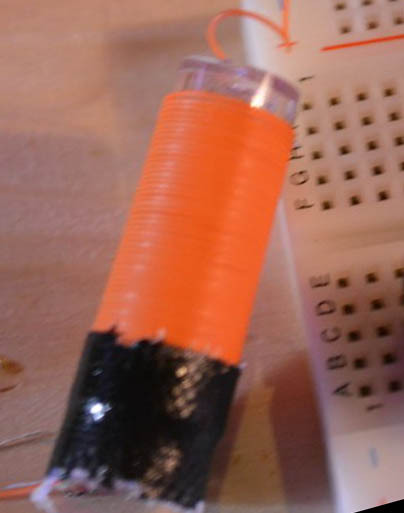 There are big plans in the works for next year’s badge that include a bare piece of copper clad FR4, a bunch of tiny disks for manhattan circuits, and maybe – if you’re lucky – a small drill press in the badge hacking area. No matter what we will see at next year’s SuperCon, all entries will be judged against the best deadbug circuit from this year, [Sprite_tm]’s voltage multiplier. While the badge hacking materials had enough microcontrollers, sensors, and other modern equipment to make something very cool, traditional components – bits of iron, transformers, and tubes – were in short supply. Lucky for [Sprite] a transformer is easy to make if you already have some magnet wire and a relay. [Sprite]’s own schematic for his build. The smallest Tesla coil secondary you’ll ever see. [Sprite]’s voltage multiplier takes power from a 9V battery and with the help of a hex Schmitt trigger and a highly modified relay, outputs about 150 Volts. From that, it’s just a bunch of caps and diodes to output 1000 Volts. In the grand scheme of things, a 1000 to 1500 V spark gap isn’t that much. For a truly insane badge hack, you’ll need a badge-mounted Tesla coil. Lucky for us, at least one person attempted a badge-based Tesla Coil. [Radu Motisan] and [Sprite] worked together on two badges: the voltage multiplier and a very tiny Tesla coil. While the badge hacking supplies had high voltage caps and diodes in spades, there wasn’t quite enough equipment to construct a miniature Tesla coil. [Radu] got as far as winding a secondary made from a beautiful orange Kynar wire he found around a pen cap. It was getting late in the day at this point, and there wasn’t enough time to complete the build. That’s a shame; we would have loved to host the first conference where a Tesla coil was built on a badge. As I said in our first roundup of the SuperCon badge hacks, we’ve hit upon something really cool with the minimalist badge philosophy. A lot of people were laying down impressive builds, and they were all different. Next year we’ll be continuing the ‘just a piece of copper clad board’ theme, and we might even have some proper transformers sitting around this time. There will be a special prize for the best mains-powered badge. Looks like [Nate] put together a new kind of audio steganography (I’ll let other people argue out whether this is the same thing as SSTV etc.). If anyone wants to try the picture spectrum analyzer thing, I was curious enough to make a Matlab for it. It’s just a change of basis from the standard basis to the cosine (or sine) basis.